Have you ever listened to Radio Caroline? The pirate radio station broadcast from a ship off the British coast is a monumental part of the history of broadcasting. The following clips were used in a BBC Essex piece about the history of the station, broadcast in 1994 (SA 1/1250/1). They include, first, the very first words broadcast from the ship in 1967; clips about the sinking of the Mi Amigo ship in 1980 when it was in the Thames Estuary (00:15); and pieces recorded with Dave Monk and Pete Moore on the successor ship, the Ross Revenge, in 1994 (02:12). By that time the ship was moored in the River Blackwater, acting as a visitor attraction – as it still is today. You can read more about the history of Radio Caroline, and listen to the present Internet broadcasts, on the station’s website. 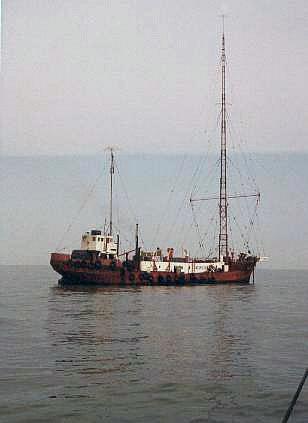 The image shows the Mi Amigo ship which was used for broadcasting Radio Caroline from 1972 to 1980, taken in 1974. It was taken by Albertoke and is used under a Creative Commons (Attribution-ShareAlike) licence. View the original here.